Orders are typically processed and shipped within 1-2 business days. We generally use FedEx or USPS for standard shipping methods, depending on what is ordered and the destination. Once an order is shipped, please allow an additional 2-5 business days for arrival. We will notify you of any exception that may cause a delivery delay within 1 day of your purchase. The shipping cost for your order can be seen in the shopping cart and during the order review prior to checkout. If you are ordering as a “Guest” then no post-payment shipping charges will ever be applied. If you are an account holder who has placed a Purchase Order or “PO”, then your shipping charges will be on your next invoice. An email confirmation is provided upon shipment of all orders. We offer both USPS Priority Mail and FedEx shipping methods. A shipping quote for your order can be seen in the shopping cart and during order review, prior to checkout. Additional lead times may apply. 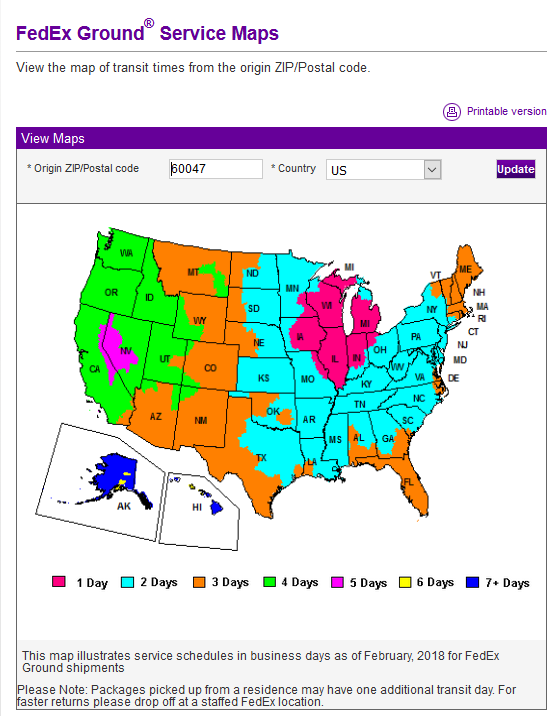 If curious about your order’s lead time, then click here to view an estimated FedEx Ground Time-In-Transit Map. Please note that this is only an estimated lead time and your order could potentially take longer to deliver. Need to rush an order? We offer faster shipping with Overnight and Two-Day delivery options. Expedited orders placed online receive higher priority and will typically ship within 24 hours or by the end of the next business day. Most expedited orders placed before 12pm CST, Monday through Friday, will be shipped the same day. Please note that delivery estimates provided are in business days and do not include weekends (For example, an order placed before noon on Friday with overnight shipping will deliver on Monday). Holidays do not count as “business days.” We do not guarantee the time of day that your order will arrive. We recommend calling us at (800) 323-1653 to order if you require guaranteed delivery by a specific date. Although generally accurate, delivery estimates provided for online orders are not guaranteed. In the unlikely event that we are unable to ship a rush order within 1 business day, you will be contacted by phone or email. You will have the option to cancel or make any changes to your order. FedEx services will not deliver to a P.O. Box address. If your order requires shipment to a P.O. Box, please check first with the shipping carrier if delivery to a P.O. Box is accepted before placing your order. If you decide to have your order shipped with FedEx; FedEx reserves the right to either leave a package or request a signature at the delivery driver's discretion. If you require a "Direct Signature Only" delivery, please let us know. You can do this either by leaving that direction as a comment during “Checkout” or by contacting us prior to placing your order. If "Direct Signature Only" service is not requested and proof of delivery is obtained, Powernail Company, Inc. is not responsible for missing merchandise. We can ship nearly anywhere in the world including all of Canada, Europe, Australia and New Zealand. We currently offer a variety of options including USPS Priority Mail, Flat-Rate Mail and FedEx shipping services. A shipping quote for most orders can be seen in the shopping cart and during order review prior to checkout. Additional lead times may apply. Please contact us if you need assistance with a shipping quote. All prices shown are in USD. We are not responsible for the payment of duties and taxes that may be applied to international shipments. Placing an order at store.powernail.com is easy. An account is not required to place an order. If this is your first purchase and you are not a dealer, simply proceed to “Check out” and select “Checkout as a Guest.” Rest assured that we do not save any address or payment information. If you are a dealer, please reach out to Powernail and request that you be registered on Store.Powernail.com. You will be able to keep track of orders online, keep your address information securely stored for a quicker checkout process and access your specific pricing. We will invoice all dealer PO’s in accordance with your pre-determined terms. Powernail is required to collect sales tax on orders shipped to destinations in the states of Illinois, Indiana, Wisconsin, California and Massachusetts. If applicable, the appropriate charges will be applied and displayed in the shopping cart and order review prior to checkout. We do not collect sales tax in other states. If you qualify for tax exemption status, please supply us with a copy of your state resale certificate, tax exemption certificate or other proof of tax exemption for your state. You may fax a copy of your tax-exempt certificate to (800) 624-5450 or scan and email to info@powernail.com - Upon approval, you will be contacted by a Powernail Customer Service Representative and your order will be taken over the phone. We strive to manufacture only the best products on the market. If a product does not meet your needs, please contact us to authorize the return of the merchandise. You may contact us by filling out the online contact form available on our “Contact Us” page or by calling toll-free (800) 323-1653. Please have the order number ready when requesting a return. A return authorization number is required for processing any return shipment. That number will only be given if your case is compliant with our return policy. We offer a 30-day return policy. Items must be returned in the original packaging and show no signs of use to qualify for a refund or store credit. Powernail is not responsible for the return freight. A 20% restocking fee will be applied. We cannot accept any returns or exchanges on items that have been used beyond saleable condition. We apologize for any inconvenience experienced if your order arrives damaged or with defective items. We will send a replacement or issue a refund for the product and shipping charges. Please contact a customer service representative immediately if you have received a damaged or defective item. We back all of our products with a Powernail Warranty. All products are packaged with warranty and service information if applicable. We encourage our customers to read this information carefully and fill out the product warranty as soon as possible. Goods will be repaired under the terms of the manufacturer warranty. If you have any questions regarding our return policy, please feel free to fill out our online contact form or call us toll-free at (800) 323-1653.